Do you need frequent drain cleaning? If it’s a home or commercial kitchen sink, the odds are you have a problem with grease and grime build up. Hydro jetting can solve those drain and sewer problems for good. 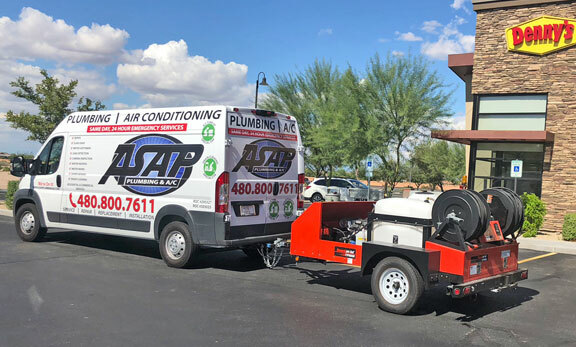 ASAP Plumbing provides affordable hydro jetting services to all Phoenix, Chandler, Gilbert Arizona and surrounding areas. Exactly What is Hydro Jetting? 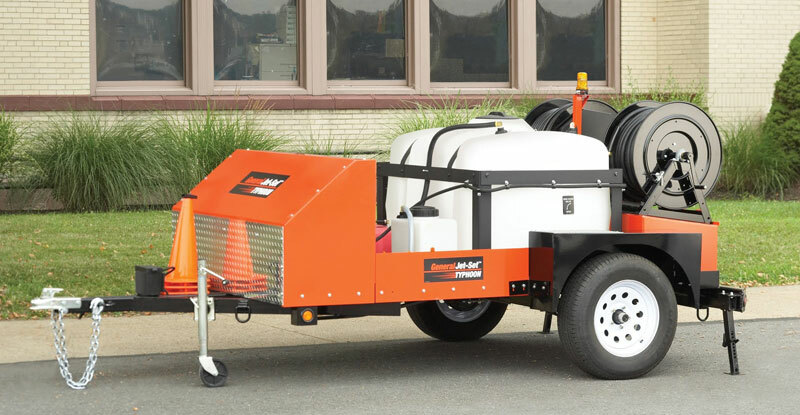 Also called water jetting or drain jetting, hydro jetting uses high-pressure water and special nozzles to create jets that blast away deposits. It can even cut through tree root invasions of your sewer line. With the right attachments, our equipment can be used on lines from 2-inch sink drains to 12-inch storm and sewer drains. A special pump boosts water pressure to as much as 4,000 psi (pounds per square inch) to feed a high-pressure hose that can be 100 feet long or more. Despite those pressures water jetting is safe because the jets are so tiny. All together the flow rate is about half that of an ordinary faucet. Each jet hits the inside of the pipe at a glancing angle to scour away any and all build up. Cabling (drain snaking) and rodding (using a solid rod to break through a clog) simply can’t remove every last bit of build up. What remains readily captures more grease and debris. Done poorly regular drain and sewer cleaning only pokes a hole through the sludge, and that hole quickly becomes blocked again. Hydro jetting is the only completely thorough way to remove every last bit of grease, hair, sludge, debris, and scale. It can even cut through tree roots 90% of the time, avoiding an expensive repair. With the insides of your pipes as smooth and clean as when they were new, you won’t be having another disruptive clog any time soon. And you’ll save money in the long run. We’re the local sewer and drain jetting experts, fully trained and with premium state-of-the-art equipment and workmanship. Our expertise and efficient procedures keep our rates economical for residential as well as restaurant drain and sewer services. When water jetting is the best route forward, and with your approval, we start with a video camera pipe inspection. That way we know exactly what to expect and assures that your pipes are in good condition and suitable for jetting. After clearing any major obstructions we’ll push the jetting head down to the far end of the line (where it meets the city sewer system) then pull it back towards the building, scouring the line clean as we go. That way grease, grime, and debris can freely flow into the city sewer. With a clean-out access, there’s absolutely no digging. We also provide scheduled preventive cleaning. It’s a critical part of restaurant plumbing services, and we recommend it for any commercial establishment that handles food. Depending on the facility, the frequency can range from once a year to every 3 months. That gets rid of existing accumulations before they cause trouble, and the thoroughly clean pipe walls inhibit future accumulation.